The latest discussions about the SublimeText package got me thinking. Are there other Mac+Windows+Linux shoulders to stand on? 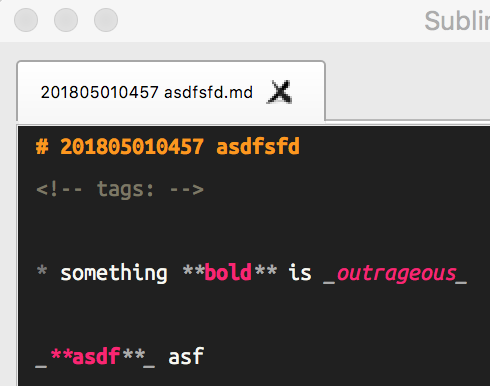 What if installing SublimeText itself, installing & configuring packages, installing the Silver Searcher, using the command palette, etc, is a bit too much for non-SublimeText-users? Can it be done without the sublime dependency? So I started an experiment.... An intensive experiment . Introducing.... the sublime-less but nonetheless non-less sublime Zettelkasten - Sublimeless_ZK ! 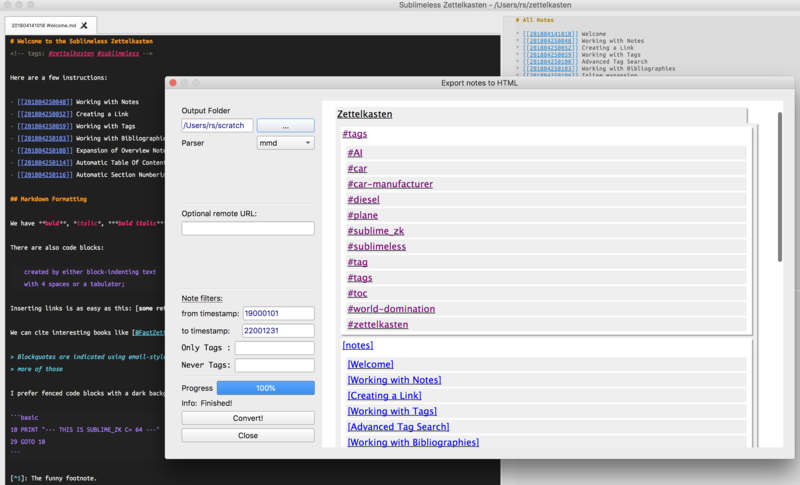 It is even more open-source than Sublime_ZK, because it doesn't need a closed-source app to run it ! Configuration can be done with identical settings (the same that Sublime_ZK uses ). Currently there are only two: A solarized light one and my favourite Monokai one. Based on its age, I consider it being alpha, and it's certainly not performance-optimized, but it is surprisingly quick and useable. I will keep playing with it and in a couple of days, when I have access to my Windows laptop again, and the README is finished, I will publish the first release (Mac + Windows) on GitHub. If anyone is interested, or as excited as I am, comments are always welcome . 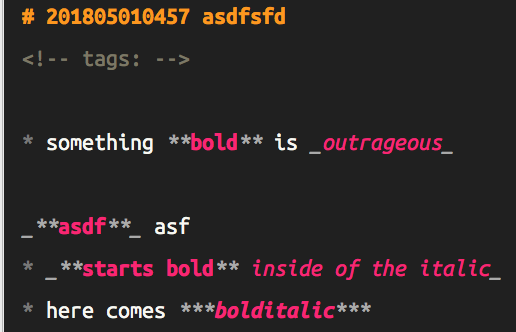 Maybe we can do things sublimelessly that aren't possible in SublimeText . That came out of nowhere! Crazy. Why did you decide to use Qt and not, say, wxWidgets? Yeah, less than two weeks ago, I attended a conference in Miami, when, inspired by recent discussions, I decided to give it a go. Motivated by initially promising looking experiments, I went straight into hacking mode for the next 10 days. The rest got cut off on my mobile, probably because I used an emoji. I also found Qt's signals and slots mechanism very good for de-coupling designs but connecting components. From an OO point of view it looked refreshingly well done and intuitive, especially compared to other frameworks that looked like a wrapper of APIs like the MFC. wxWidgets would have been my choice #2, as every time I checked, it appeared to be very mature and not that hard to use. Qt has a very good C++ API that can help writing cross-platform native apps without having to implement a cross-platform layer for more low level systems programming tasks, and it definitely helped when C++ didn't have easy to use containers, threads, sockets, etc. Having said that, I hardly ever do GUI stuff, so what the bleep do I know. Since I run Ubuntu on my laptop, my options are limited, and your sublime-text plugin rushed in to fill the vacuum. But if this is available, I'd love to migrate. I'm still more or less a Linux noob despite knowing a few tricks. I git cloned your repository and tried run the make_exe.sh file, but couldn't get it to work. Anything I'm missing? Here's the error I get if it helps. Yeah, you are missing a couple of python packages, like cx_freeze, ... Please be patient. I will tackle Linux "install" very soon. Basically, under Linux, there won't be the need for "building", it's more about getting dependencies satisfied. You would need python 3.6, and a couple of python modules, such as pyqt, qscintilla (forgot the name, will dig it up), etc. Then you can just run sublimeless_zk directly. At the moment, there are only binaries for macOS and Windows 10. Shortly, instructions will be updated for running it on Linux. Hope anyone finds this useful --- well, at least I do. I am really surprised how much I like just clicking or alt+clicking on links, as opposed to ctrl+enter-ing them (as I would usually do in sublime_zk). Makes using the search results much more effective. So, if anyone tries it: have fun! I started my ZK last week, migrating everything from DevonThink and other apps. Is it possible to have Sublimeless in the same machine? For now I'm with Sublime_ZK. I started my ZK last week, migrating everything from DevonThink and other apps. Is it possible to have Sublimeless in the same machine? For now I'm with ZK. Yes, you can have Sublimeless on the same machine. and won't have any problems! Excellent. 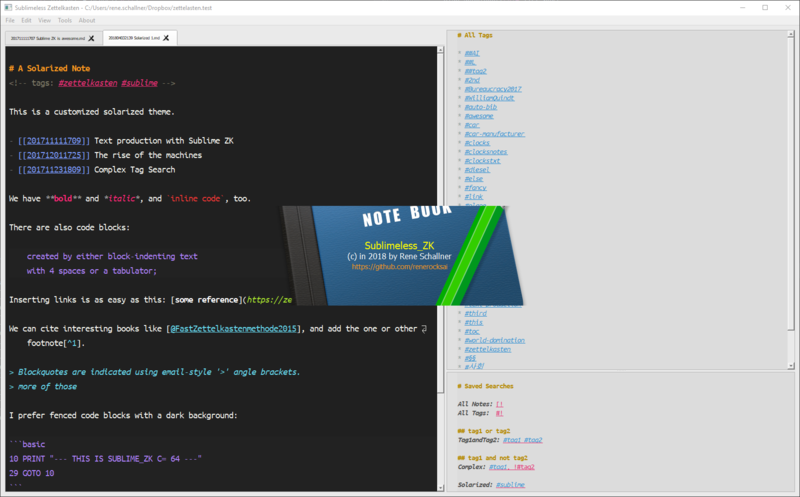 It's been a week, but so far I am impressed with Sublime_ZK. Love at first sight, thank you for your time and effort, means a lot to us. An alternative way of installing Python 3.6 might be to use Pyenv. It is also described in the link above. @rene Really great work! I'm looking forward to toying around with it more, but at first glance it seems really great. There's much less friction as opposed to the sublime-plugin. You already mentioned how much you enjoyed not having to press ctrl-enter to follow links anymore. I think that the absence of such small obstacles makes for a really great user experience. I am on an old Ubuntu 16.04 box here and it is giving me headaches using PyInstaller, doesnt like cx_freeze... Eventually I will get around it and be able to produce a Linux executeable. Until then: glad you got it to work the command line way!!!!! are up on GitHub , in the releases section. There are also alternative Linux instructions in the README if for some reason the provided binary doesn't work on your specific Linux. I'll keep playing around with it and see what else I come across. Nice work so far! That is both awesome news and awesome feedback !!!!!! as for 3., I suspect what you describe is actually a bug in the syntax of Sublime_ZK that I introduced for syntax-coloring YAML headers: A # heading in the 1st line does not get recognized. If you insert an empty line before your first line, you will see the section numbering of your note title. So to not break with the common expectation that all headings get numbered (would be odd if you didn't know and for instance use a YAML header for your notes and therefore would likely want the 1st heading to be included in the numbering), I will introduce a setting for that: `"ignore_first_heading_in_numbering: false", or something like that. As for the Mac key combinations: I will have to play around with that. 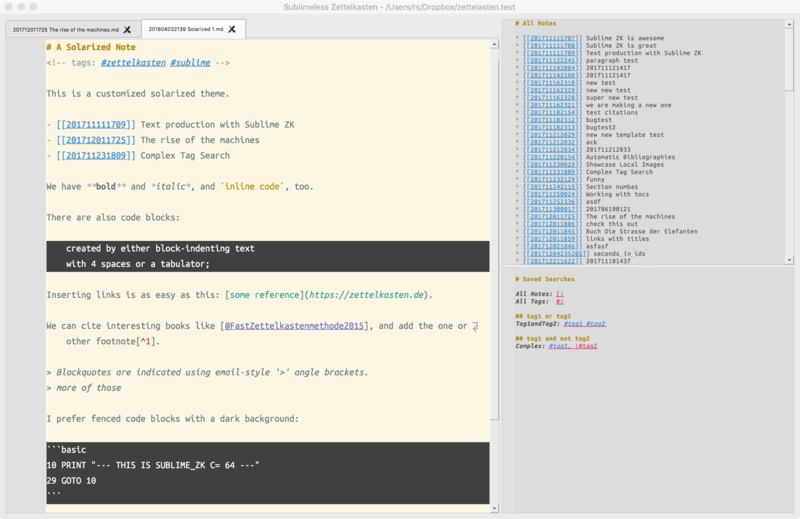 I haven't updated the README yet, not even the SublimeText animations ... , but you can click through the menus (File, View) to see the new stuff. Thank you @adam, I've got it up and running! Really looking forward to everything you're doing @rene! Your work has been a godsend. Unfortunately, on Linux, there is no HTML preview but an "open in browser" button instead. This is because of the way the executable is sandboxed, it just turned out too much of a hassle. On top of that, my nuoveau graphics driver choked on the web view, causing it to crash very often. Again, on Linux, if you want to run the sources directly, please note the additional dependencies, as described here. Thank you! Cool the Linux guys are working together! When do you sleep, @rene? Tabs are inserted as spaces by default; option to insert tabs instead? Wrapped lines indent past original indent; option to align? 3.1 Option to turn off line-wrap arrows? After an indented paragraph, the return key creates a line indented to the level of the paragraph above it. 5.1 When the side panes are closed, the main window expands to fill the space, but it cannot be reduced back to its original size (or at all). Potentially major feature requests: spell check, autocorrect, word count. As for citations: I will put extra logic in there. I am specifically searching for authors. If none are found, none are displayed . But taking editors instead makes sense. I was not aware of that. And the return key issue should be easy to be fixed, too. 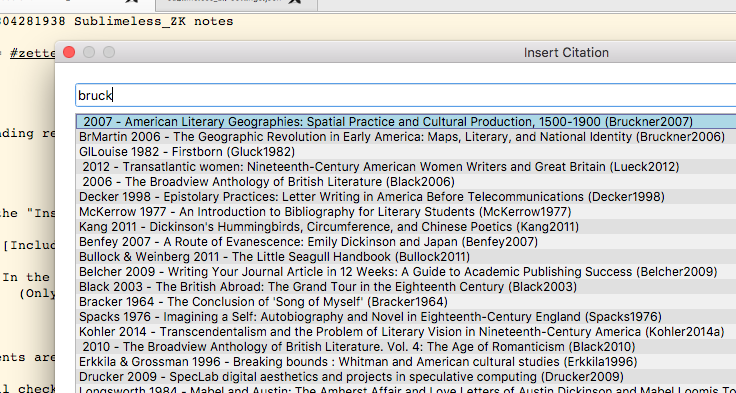 Aaah, the ü: I process bibtex files into something ASCII-compatible. There the dots above the ü get lost in translation into an u. I can check if going full UTF-8 will break the parser. I can't see how you can live without the search results. 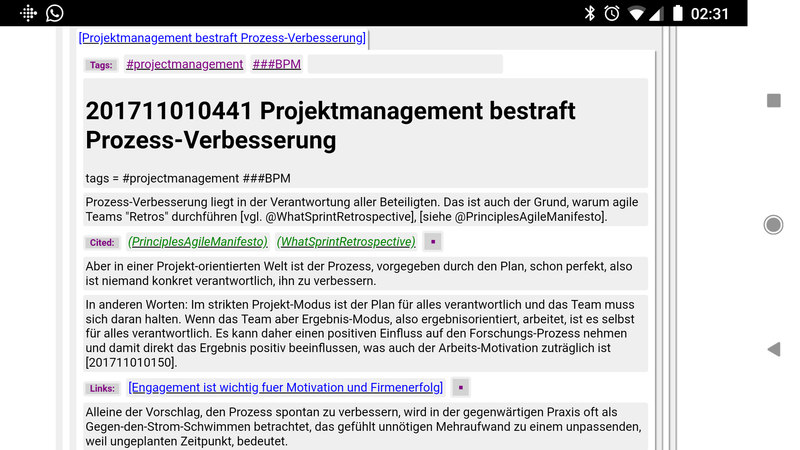 I will update the README though, and make sure there is a way to bring them back (View > Show/hide side-panel?). Spell-check & auto-correct might be a bigger one (platform-independent) but I can dig around. Word count is a breeze. A show/hide side panel option (maybe even with a nice user-friendly shortcut?!) would be great! Could the shortcut cmd-shift-[ cycle backward through open notes (to the left) and cmd-shift-] cycle forward (to the right)? As for _**: Currently (as of the yet unreleased 0.5) _**text**_ is interpreted as: start italic, then comes no text because what comes is: start bold, text (bold), end bold, end italic. If you want bolditalic, you should use *** or ___. ad 3. I cannot reproduce your examples from the screen-shots. Can you isolate the text that is causing problems (replace it by sharable text) and show it to me? If you insert more than 7 spaces before the first line (ie, indent the first line twice), style problems appear in the lines that follow. You can indent the lines after the first line as much as you want with no additional problems. But, if you indent the last line of the file (when there are no empty lines following it) the program crashes. Also, if you have a file with just a single word, and you indent that word, the program will crash, because in that case, the first (and only) line is also the last line. This will be fixed in 0.5. If you run the sources, you can pull them to get rid of the crashes.